Dear Lance, thank you for sharing your wonderful painting and writing the background for your inspiration. You inspire us all. Best to you and Raul! Lemony, it is a delight having you come and comment. Your recent flower portraits are exquisite. THANK YOU Laura and Rebecca!! This is spectacular! Wow. The light, the clouds… love it. …Jodi, I so enjoy your site, thank you for stopping in with your encouragements. ….another lovely visit by you, Cynthia–thank you (again)! 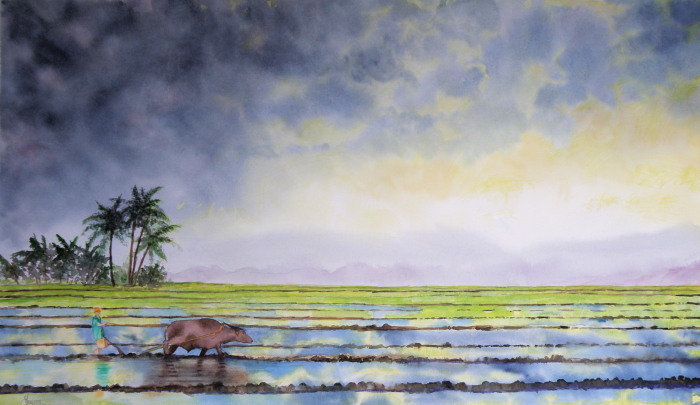 How beautifully you describe that symbiosis between the rice worker and the carabao, and how exquisite your painting! …oh, I am very happy to learn of your family connection to that remarkable country. And ‘color bone’ is bringing a big smile, barry! Oh funny. I forgot to say “nice design and painting”. This one in particular strikes my color bone. It’s a small world. My cousin and her partner are moving to the Philippines to be close to her partner’s family.